We recognize them when we see them: successful video ads. You know the ones. They make us laugh. Or cry. Sometimes they make us think – about the way we view the world, about the choices we make. No matter what the intended emotional response, successful video ads make a lasting impact, not only on your viewers, but also on your bottom line. After all, that’s the goal of online marketing and every other form of consumer advertising: to make money. So what’s the difference between effective video advertising and, well, everything else? There are three things your video ads must have to be successful, according to a group of senior marketing executives at a recent iMedia Video Summit. Professionally-created video outperformed user-made video by 30% in a 2012 Comscore report. Why? Video makes a statement about your company’s image. Today’s video-savvy audiences know quality video when they see it. If it’s mediocre, they can tell. And a mediocre video sends the message that your product is mediocre, that your company isn’t professional. The bottom line? They won’t take you seriously. And they won’t buy your product or service. Don’t settle for less than the best quality, especially when it comes to establishing your brand, image and culture with something like a business profile video or testimonials. The little details of high quality work are seldom noticed. You simply enjoy it. Low quality work is always noticeable. Your viewers are busy, and competition for their time is fierce. But there’s good news. According to MarketingCharts.com, nearly four out of five consumers will spend at least two minutes watching a good video ad that educates them about a product they plan to purchase. But if the content on that video isn’t valuable, you’ve wasted their time. You’ll definitely lose them – a patient, client, or donor… forever. Have you ever seen a great commercial only to wonder at the end what it was advertising? Video ads without a clear call to action are perhaps the biggest failure of all. The goal of any advertisement, as harsh as it sounds, is to get viewers to do what you want – to laugh, to cry, to make an emotional connection with your product or service… to get them to trust you, or to at least build some credibility and begin to nurture a relationship … and ultimately, to become your customer. So, while you can certainly create your own video ad – or get your neighbor’s cousin’s kid, Joey, to do it – this is probably one aspect of online marketing you should leave to the professionals. Effective video advertising is both science and art, a delicate balancing act of creativity and content with a clear call to action for the viewer. Upset that balance and you could end up driving clients away. 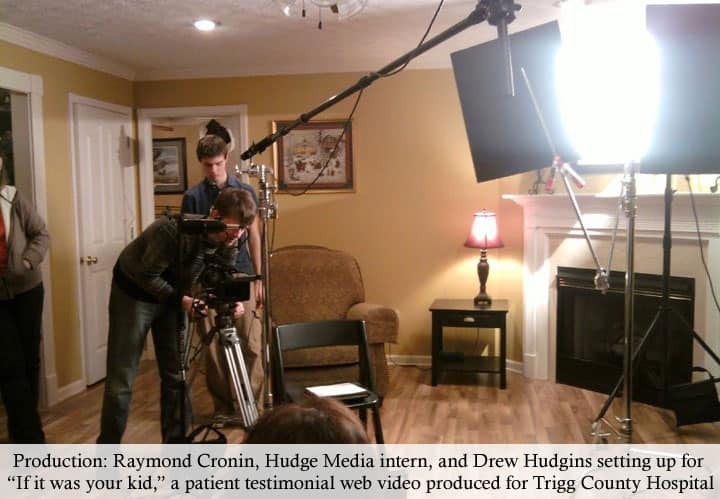 Hudge Creative creates effective online marketing strategies, including successful video ads. If you’ve said, “We tried video. It didn’t work,” or “We spent money on video… but the results were only so-so,” then the problem wasn’t use of video (there’s no denying its effectiveness and popularity); the issue goes deeper. Start talking to Hudge now about a winning video content strategy.